There is a reason that everyone (or, as I have been horrified to recently discover, almost everyone) loves the classic film, The Wizard of Oz. The timeless themes, memorable characters, archetypical journey, and its classic representation of movie magic. 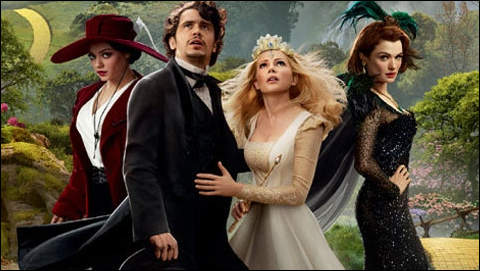 While Oz the Great and Powerful is enjoyable in some regards, and is in nearly every regard better than I expected it to be, it fails to live up to the standard set by its predecessor. This is by new means a surprise, but what I did personally find shocking was how close it was to at least being close. The movie opens in black-and-white in 4:3 Academy ratio (later transitioning into color upon entering Oz, in homage to the original film). Coincidentally, the transition from reality into Oz also marks the progressive decline of the film’s quality. The initial scenes in Kansas where our protagonist, Oscar "Oz" Diggs (James Franco) is introduced, along with other characters who later appear in Oz incarnations (Zach Braff, later as a flying monkey, and Michelle Williams, as Glenda) were entertaining. The humor worked, and a particular scene where Oz is exposed as a fraud was also effectively depressing. Upon finding himself in the Land of Oz, Oz meets Theodora, a witch (played by Mila Kunis), who believes he is the prophesized savior of the land. She almost immediately falls in love with Oz, setting her up for a disappointing character arc that (SPOILER ALERT – culminates in the worst villain origin story since Darth Vader’s). Oz decides to play the role of the messiah, destined to defeat the Wicked Witch and save the world. Alongside a couple friends made along the way, he has to keep up his façade, while fulfilling his destiny. The story is nothing to brag about, with obvious twists, and silly plot points, but there are cool scenes, usually involving Oz’s use of practical effects against the Wicked Witch’s forces. Unfortunately, the movie as a whole lacks said practical effects. The movie is heavy on CGI, and Oz is visually stunning. It’s vibrant and colorful, but it’s also sterile and detached. There are a few good shots (the movie is obviously meant to be watched in 3D), but the green screen is evident and there’s never a real feeling of tension and engrossment because nothing feels real. This wasn’t helped by the inconsistent tone of the movie. Scenes that should have been intense or suspenseful had the tension drained from them due to inappropriately timed comedic relief. Ultimately, the movie failed due to a sloppy script, overreliance on computer effects, and an inconsistent tone. There were small gems that showed that there was potential to really make a movie that deserved to share the same name as the classic Wizard of Oz and the cult classic Return to Oz, such as some pretty good humor, winks and nods, charming scenes, and abstaining from a lot of reimagined fairy tale clichés, but above all else, it failed to truly capture the magic that touched so many long ago.